Ideally situated within the Allegheny Mountains, The Omni Homestead Resort offers an inspired setting for any event or meeting, intimate or grand. For over 200 years, the resort has hosted productive, sophisticated events at its Virginia convention center surroundings for industries and events of all kinds. 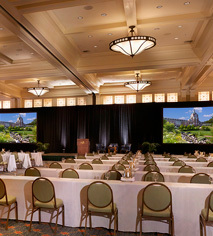 With over 72,000 square feet of venue space and 28 available rooms, the expansive conference and convention center is fully-equipped to accommodate business meetings, theme parties, picnics, small luncheons, intimate dinners, and large banquets complemented by exceptional service, beautiful catering, and state-of-the-art technical resources and conference amenities. 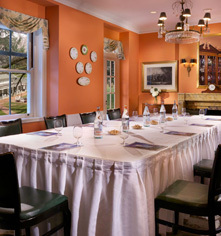 From the expansive Grand Ballroom and Regency Ballroom, to the elegant, two-level Commonwealth room with its hand-painted murals, The Omni Homestead's meeting spaces are as functional as they are beautiful. The Crystal and Empire rooms are well-appointed with stately columns and magnificent chandeliers, while the Tower Hospitality Suite provides ample and inspiring room for guests to collaborate, gather, and unwind in perfect comfort while enjoying spectacular mountain views. 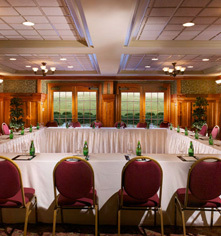 For outdoor events, a variety of unique and memorable venues are available, including the Mountain Lodge and Cascades Golf Club, and the Outdoor Pavilion at the Shooting Club. Each of these memorable convention centers looks out onto the most spectacular views in the valley.